… but at a massive 97 percent discount over the first copy sold. A bargain so get in quick before stocks run out! 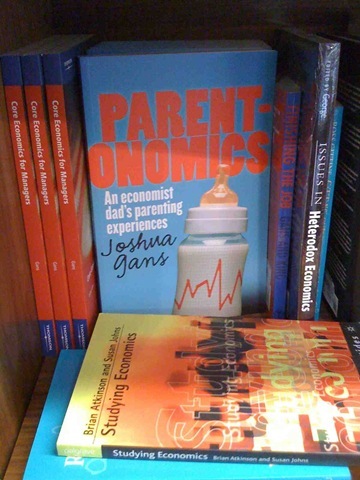 To the left, it was sighted at the University of Melbourne Bookstore in the (not surprisingly) economics section. For online options that I know about, click here. And all readers of this blog are invited to the official launch of the book at the Melbourne Writer’s Festival (click here for an invite and here for other details). In other news, in both the Sydney Morning Herald and Age this morning I am quoted as not being able to make head or tails of our child care rebate scheme. This financial year, the Rudd Government introduced changes to ease the burden of child-care fees and to try to simplify the labyrinth of government assistance (see box). Unfortunately, parents and experts remain confused. Sacha Morolitsz’s blog has more.